Canoeing and Kayaking in Florida with Canoe Outpost, Inc.
For the true Florida experience, paddle the majestic Suwannee with its "white-water" stretches and white sandy beaches; the spring-fed Santa Fe's crystal clear water; the shady, "Outstanding Florida Waterway," Little Manatee River; or the beautiful, meandering Peace River, a fossil mecca. Paddle with the best, Canoe Outpost®, on Florida's finest rivers. 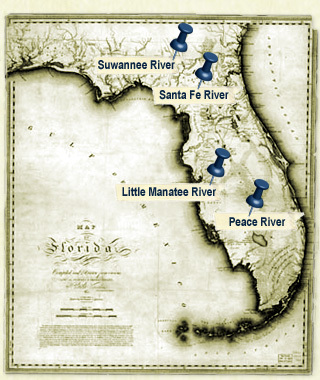 Paddle 'em all and go for the "Grand Slam of Florida Waterways." Canoe Outpost®, sometimes known as "Canoe Central", is your source for the best in paddling in Florida. With Canoe Outpost®, you can paddle "across" Florida and be assured that years of experience offer the best in equipment and service. Contact any Canoe Outpost® to plan your Florida paddling experience, it's easy to learn and fun for all.